In Strathcona County, east of Edmonton, Alberta, a farmer had recently moved his horses to a different pasture. 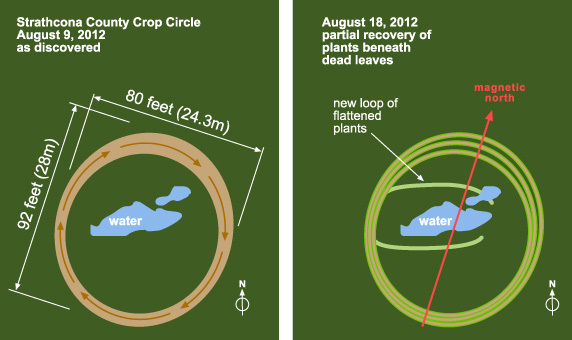 On August 9, 2012, on a routine check to this new pasture, the odd circle was discovered. It was a large ring of dry, brown plants, all flattened in a clockwise circle. There had been many summer storms pass through the area in recent weeks. Was this a phenomenon caused by a tornado, whirlwind, hail storm or something else? The ring measured about 92 ft (28m) on the long axis and 80 feet (24.3m) on the short axis. The width of the ring varied from 5 to 8 feet wide (about 2m). The long north-south axis of the ellipse aligned with magnetic north on my compass, which, at this location, is about 18˚E of polar north. The plants were flattened in a clockwise direction. The ring encircled a wet area and some small pools. As there had been frequent rains in the area, the ground was soft and damp . The center pool and reeds appeared undisturbed. There were no animal hoof prints or human footprints in the ring. There were no fresh ATV tracks in the pasture. 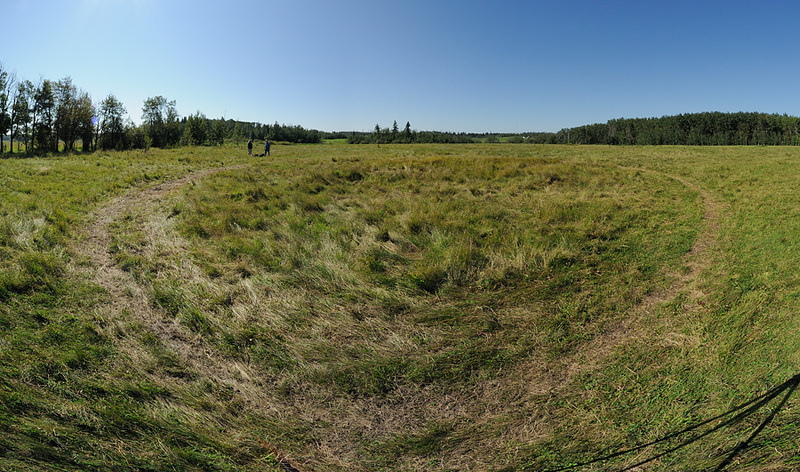 The circle, almost 1/2 mile (0.8km) from the nearest public road, is hidden from public view by thick poplar forest. A wet and rutted trail on private land is not accessible by passenger vehicle. The owners use an ATV to check on the animals. Adjoining properties do not offer closer road access. My husband I visited the circle on August 18th, nine days after it had been discovered. The pasture vegetation was thick fescue grass and clover with a few weeds. Plant recovery showed evidence of three or four separate but overlapping narrower tracks within the larger ring. Leaves that had been flattened were still dead but new leaves had started to shoot out from the roots along the edge of the rings. The plants at the midlines of the inner rings were browner, as if they had been more severely affected by whatever agent had flattened the plants. Both grasses and broad-leaved plants at the edges of the rings were sending out new leaves. There was no evidence of plant deformity, as might be expected if a herbicide had been used. On our August 18th visit, we noticed a partial loop of bent, but not fully flattened, grasses in the center of the ring (indicated by the light green line on the diagram). It started in the wet center and looped to the west edge of the ring. Again, there was no evidence it had been flattened by animals or humans. The landowner had not seen that loop upon first discovery. At the request of the landowners, I will not be disclosing the location of this crop formation.